March 8, 2017 – Registration for Credit Valley Conservation’s (CVC) popular Conservation Youth Corps (CYC) program is now open. High school students can earn up to 35 volunteer hours in one week this summer by participating in environmental stewardship activities. Space is limited so students are encouraged to sign up early. 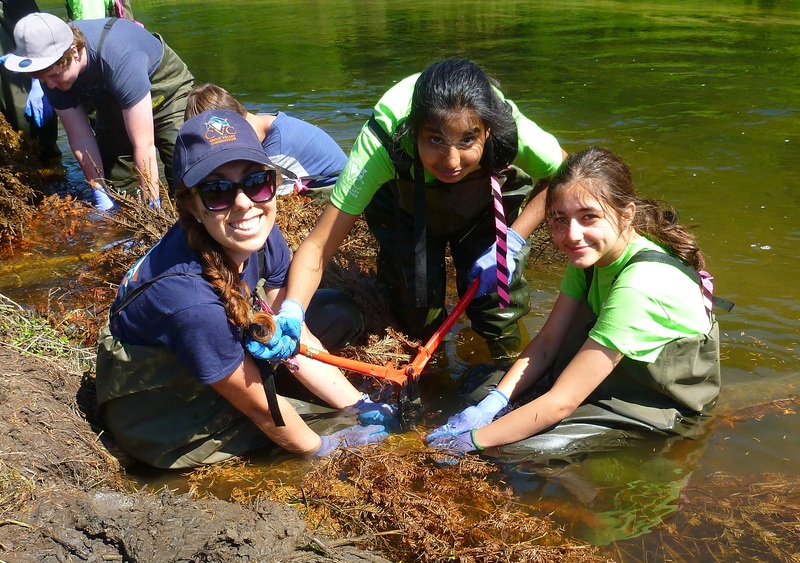 The CYC summer program is open to high school students in the Credit River Watershed, from Orangeville to Mississauga. Participants volunteer in groups of seven with CVC staff for one week of the summer. The first volunteer day consists of an orientation session at Terra Cotta Conservation Area. Remaining days are spent completing restoration and ecological projects. Each year, approximately 250 students work on a range of activities that benefit nature, while earning up to 35 of the 40 volunteer hours needed to graduate high school. Activities include tree planting, managing invasive species, aquatic and terrestrial monitoring, fish and wildlife habitat construction, community gardening, trail maintenance and more. The CYC program celebrated its eleventh year last summer. Nearly 2,400 students have joined the week-long summer program since 2006 and have contributed 76,400 hours of service. Through partnerships with landowners and supporters, these students planted more than 25,300 trees to help fight climate change. Students have also removed more than 9,000 individual invasive species like garlic mustard, honeysuckle and buckthorn. This work has taken place on 160 different properties. Volunteers have an opportunity to learn about the environment through meaningful experiences, explore different areas of the Credit River Watershed and meet new people. The CYC summer program also looks impressive on a resume, and on college and university applications. All training and tools are provided. For more information and to register, visit cvc.ca/cyc or call CVC at 906-670-1615 or toll free at 1-800-668-5557. Applications will be accepted through CYC’s online process. The CYC program is made possible through generous support of donors and sponsors including the Region of Peel, TD FEF in Mississauga and Brampton, and Ontario Trillium Foundation – Grow Green Grant.